Last year, we joined 350.org and concerned citizens across the country in spreading the word that the Keystone XL tar sands pipeline has no place in a national vision for clean energy. On November 6, 2011, citizens surrounded the Whitehouse, over 1200 people were arrested during several weeks of peaceful protest, and thousands of voices from across the country helped provide the political leverage to stop forward movement on the pipeline. It was a real victory in the battle to re-shape our energy future. 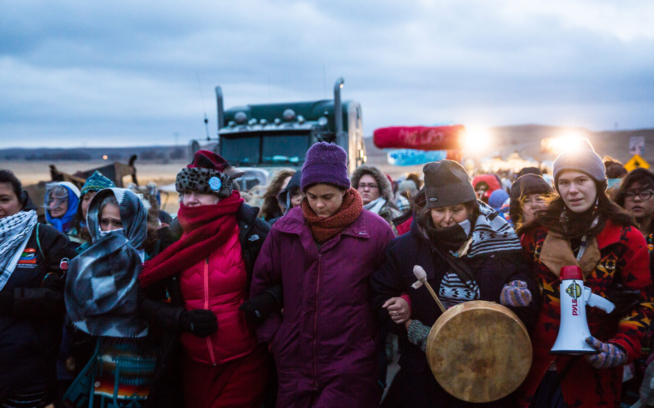 But – today, the fight against the Keystone XL tar sands pipeline has reached another crucial turning point. The Senate may vote as early as tomorrow to green light construction of this project without additional environmental or economic review. Senators in favor of the pipeline are trying to attach a measure to the current transportation bill that would likely lead to approval of the project. For the coming day (until noon EST, Tuesday Feb. 14), we’re joining 350.org and a coalition of other groups to gather 500,000 messages to the Senate, opposing the pipeline. 2. Share this message with your friends, family and community. The Keystone XL Tar Sands Pipeline would originate in Alberta, Canada and pass through the West and Midwest of the United States ending up in Houston where most of the oil will be shipped overseas. Six companies have contracted for three-quarters of the oil. Five are foreign. Tar sands fuel is some of the dirtiest on the planet and our top climate scientist, NASA’s Dr. James Hansen, has said that fully exploiting the tar sands would mean “game over” for the climate. Thank you for being a part of this historic movement. Hans Cole is the Director of Campaigns and Advocacy for Patagonia, Inc.